Town and Country Planning Nagaon Recruitment 2017 Jr. Asstt. Town and Country Planning Nagaon Recruitment 2017 notification about for filling up following Junior Assistant jobs under Town & Country Planning Nagaon, Assam. Qualification: Candidates should be passed Degree examination from a Govt. recognized university and must and possess the Computer Skills for handling data and text on computer. The candidates whose applications are accepted will be required to appear in a Written Test on General Knowledge, General English, and General Aptitude when called for. Successful shorted candidates in the Written Test will be called for Computer Practical Test on MS Office on dates notified later. Application Fee: A Treasury Challan of Rs.250/- for general candidates and Rs.150/- for SC/ST/OBC/MOBC should be deposited in the Head of Account ''0070-Other Administrative Services-60-Other Services-800-Other Receipts.'' Fee exampted for BPL certificate candidates. 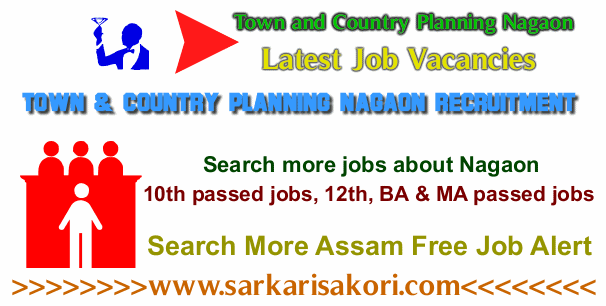 You will be interested more jobs about Town and Country Planning Nagaon Recruitment & Latest Assam Govt Jobs Alert 2017.